Formed over a decade ago in Madrid, Spain, Rancor is a band whose members unabashedly emulate the glorious early days of thrash on their debut long-player Release The Rancor. The ten songs offered here fall squarely in the realm of Testament, Exodus, early Metallica, and the like, giving retro-thrash fans everything they want from the style without drifting off onto contemporary tangents. Like so many other bands that work hard at paying tribute to their influences, Rancor sticks to the formula and sacrifices ingenuity for the sake of energy and skillful execution. Guitarists Ricky and Vasco lay down plenty of stylized riffs at a pace that moves along at a pretty fair clip, though I'd stop short of calling Release The Rancor a blistering album. A knock I have against the disc is the pacing of the first half, as there's little to differentiate the first three tracks from each other, but by "From Warrior To God" Rancor begins to mix up the tempo and introduce more variety to the riffs. "Twist The Knife" is a song that serves as the best example of what Rancor is capable of, opening with a strong rumbling bass line from Serra and finding just a bit more menace creeping into Ricky and Vasco's riffs - not to mention a pretty wild solo. The song also finds frontman Dani adding a little more character to his thrashy style, an aspect that definitely warrants further exploration on Rancor's next effort. Don't get me wrong, he delivers the goods in a formidable, gritty performance throughout the album, but exercising his range a bit more will only add depth and increase the band's staying power. 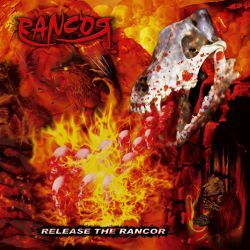 With songs like "Twist The Knife", the somewhat doomy "Drag You To Hell", and the flailing "Zombie War" - all prototypical thrash anthems that genre fans crave - Release The Rancor is for sure a solid album custom-made for those of us who have fond memories of the original Bay Area sound. Not groundbreaking, at times a little repetitive, but an enjoyable listen nevertheless.